Homemade ice pops are tasty, inexpensive, and healthy. Here are some versions to try this summer. 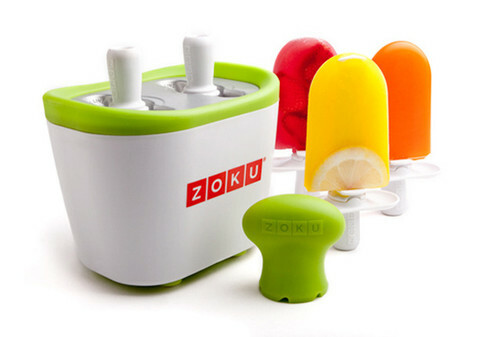 Though I’d love to buy a Zoku pop maker, I’ll wait until I see one on sale. For now, I’ll use the good old-fashioned cup and stick method, or maybe get some basic molds. We bought a bottled organic lemonade (cherry-lemon blend) that tasted just awful, but we salvaged the juice by pouring it into ice pop molds. The lemonade was delicious frozen! So if you have drips and drabs of leftover juice or you bought a somewhat vile-tasting product, try freezing it. Of course it’s a no-brainer–mix low-fat yogurt with berries in a food processor and pour into molds. Whatever doesn’t fit into the molds is a smoothie, anyhow, so drink up. My kids love this kind of blend as an ice pop. If the blend needs some liquid, just drop in a bit of fruit juice or lemon juice to thin it out a bit. mix 1/2 packet of Crystal Light lemonade powder with 1 cup cold water. in another bowl, dissolve one 3-oz package of sugar-free strawberry jello in 1 cup boiling water. blend lemonade and jello mixtures. 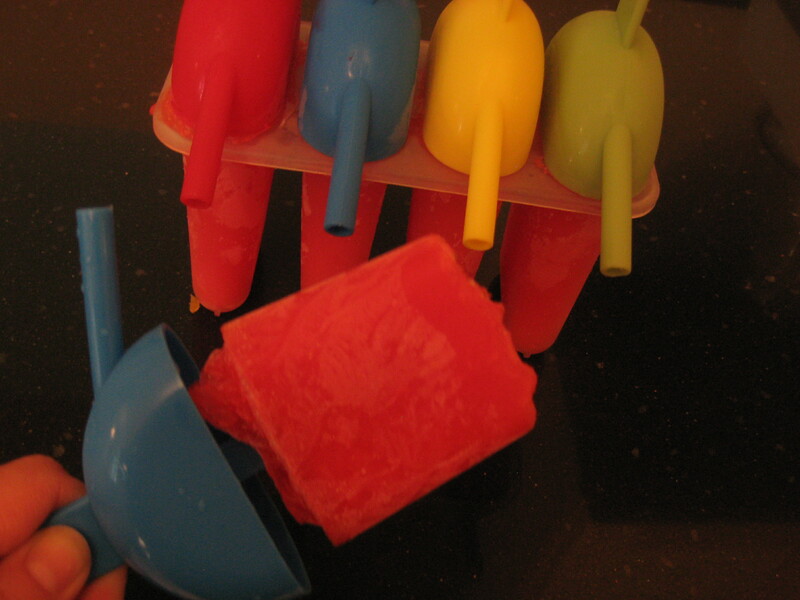 pour blended mixture into ice pop molds to freeze. For more sugar-free pop ideas, visit Sixuntilme.com. Also visit All Recipes for this dessert. And new!! Click here for more frugal, innovative ways to use up bits of fruit and fruit juice. I’ll spare you the experiment I made by whipping together part-skim ricotta cheese and strawberries. Ricotta is great whipped with fruit and a bit of sugar (tiny bit), but frozen, you have to develop somewhat of a taste for it. The ricotta-strawberry pop idea is good for a low-low-low-fat and low-low-low-sugar treat, but don’t count on your kids asking for seconds. Stick to the lemonade/jello recipes for happy kids! Perfect post. Hubby and I love frozen fruit pops. Gotta get a form set so we can make our own. Here’s another frugal tip. Frugal Gazette gives this frugal recipe: whenever you have finished with your jam, preserves or jelly and there is still a hint of the stuff left in the jar, simply add in a bit of milk, shake and then pour into a pop cycle mold and freeze. Delish. Thanks for the pingback! I’m loving Popsicles this summer!